The trustees are counting the number of emails they receive and the number of people expressing support at meetings. At the last meeting, the audience was evenly split between those favoring opting in and those opposed. Your voice and your presence are needed! Email the Trustees at the addresses below and attend their next meeting on Tuesday, June 26 at 7:00pm. Why should the Village Trustees vote to OPT-IN to the Cook County Minimum Wage and Sick Leave ordinances? Here are just a few reasons . . .
A full time worker earning $8.25 per hour earns a pre-tax annual income of $17,160 by working 40 hours a week, every week of the year. This is not enough to provide for their basic food, shelter and healthcare needs. The working group report indicates that 70-80% of low wage earners in Wilmette support families. The Cook County living wage for a ONE person household is $13.30/hour. Our workers need more than $8.25/hour to support others in their households. $8.25 per hour is the minimum wage law in ALL parts of Illinois, regardless of a worker’s cost of living. Workers in Cook County must earn $13.30/hour to pay for basic food, shelter and healthcare needs vs. workers in a small, downstate communities. More than 1/3 of our local workforce does not earn paid sick time. 43% of food-borne illnesses are caused by employees who come to work sick. Without paid sick time, workers must sometimes choose between their income and going to work sick or sending children to school sick. When workers do not earn wages to support their basic food, shelter and healthcare needs, we pay to support them. For example, Township services like the food pantry and child care funding generally support working families trying to make ends meet. A fair wage reduces worker dependence on government and community subsidies. 3. It's what Wilmette residents support! 66% of residents polled by the working group think minimum wage is too low. 2/3 support enacting both the minimum wage and paid sick leave ordinances in Wilmette. The Village Board formed the minimum wage and sick leave working group to investigate the local impact of the ordinances. Wilmette and Trustees should act in accordance with the findings of their study which support enacting the ordinances. Chicago enacted “home rule” minimum wage and sick leave ordinances in 2014, affecting thousands of businesses and hundreds of thousands of employees. The City's ordinances have not been legally challenged since they went into effect in 2015. Multiple peer-reviewed scholarly studies are included in the working group report. The most scientifically rigorous of these reports clearly demonstrate that raising minimum wage has no negative effect on local businesses or employees. The working group report includes interviews with local real estate professionals regarding the effect of the ordinances on the local market. Those interviewed reported that the ordinances have no impact on a business owner's decision to locate in Wilmette. According to the Wilmette Chamber of Commerce, “most Wilmette businesses already pay their employees more than $13/hour.” The minimum wage ordinance ensures that future employers provide for their employees as generously as the current local businesses we support. The City of Chicago enacted new minimum wage and sick leave ordinances in 2015. Since then, job growth in Chicago has been 11% higher than in suburban communities without similar ordinances. Hundreds of businesses in Skokie and Evanston were impacted when the ordinances went into effect last July, but both business communities continue to thrive. Only one of our closest neighboring communities did not enact the ordinances when they went into effect in 2017. Click on the graphic to see it as a PDF. On May 15th, 7 pm, the Final Report of the Minimum Wage & Paid Sick Leave Working Group was presented to the Village Board at a special Committee of the Whole meeting at Village Hall. 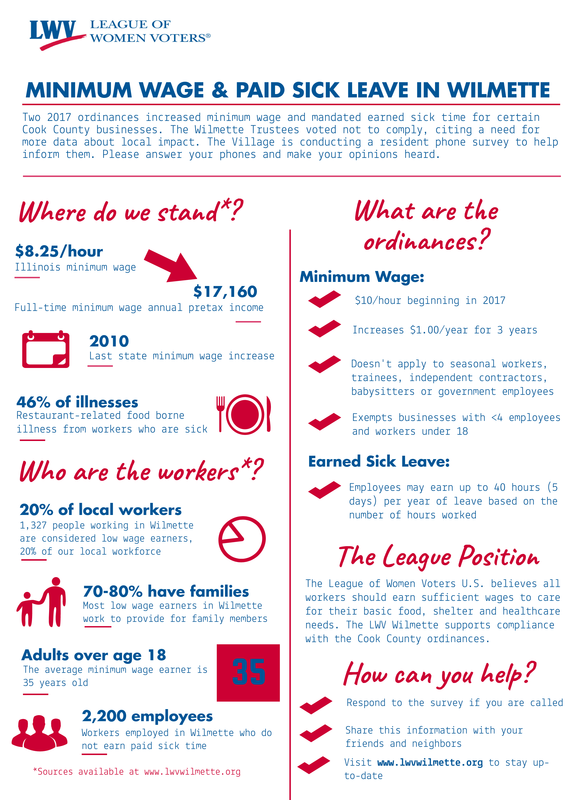 The LWV-W supports reversing the Village Board’s decision to opt out of the Cook County ordinances that raise minimum wage and mandate paid sick time for hourly workers. Click HERE to review the Working Group's final report. In 2017 two new ordinances raised minimum wage and mandated paid sick leave for employees of Cook County businesses. As a Home Rule municipality, the Village Trustees voted not to comply with the ordinances, citing a need for more data about local impact. A working group of citizens began meeting in January to collect information to inform the Trustees decision. The data will include published studies, results of a business survey, information about business conditions in surrounding communities that have complied with the ordinance and a resident survey. The Village will begin a phone survey of residents in early April. For more information about the Village working group visit www.wilmette.com and type “Working Group” in the search box. Thank you for your January 10 letter. As the Working Group proceeds with its information-gathering task, I hope you'll continue to participate and make suggestions. Please allow me to offer a few comments regarding the points made in your letter. Your letter makes a similar point regarding Wilmette employees. Again, the December 27 memo recognizes the importance of soliciting information from employees. You'll soon see that one of the questionnaires being developed by the Working Group is directed to employees and is designed to obtain information from them.One of our concerns is how to distribute the employee questionnaire to elicit the maximum number of responses, and if you have any ideas in this regard, they'd also be welcome. I'm very sensitive to the matter of "bias" raised in your letter. I frankly didn't see the basis for this concern a the January 8 meeting. However, I view it as one of my principal roles as Chair to make sure that the information-gathering process is balanced and thorough, and I'll continue to remind myself and the other members of the Working Group that our job is to impartially obtain and transmit an unbiased package of information relevant to the underlying issues and to suppress any proclivity we might have as individuals to favor one side or the other. Making a recommendation, either expressly or by slanting the information presented, would be exceeding the scope of our charge and entirely improper. Finally, I agree that the Working Group, as you suggest, should seek credible and relevant quantitative analyses. Thank you again for helping us work our way through this challenging process. ​Thank you for convening the Minimum Wage & Earned Paid Sick Leave Working Group. Our LWV-W Observer Report for Monday evening’s meeting will be posted on our website soon. In the meantime we would like to share feedback that we hope will be helpful. We appreciate your important charge to the group to set aside bias and seek information. We also appreciate the willingness of the working group to engage with the community in attendance at the meeting. The atmosphere was thoughtful and the discourse civil. We hope this practice will continue. During the meeting, it was striking that there is not a clear commitment to seeking and considering the will of the village residents who, after all, are the people who elect the trustees. The perspective and wishes of the Wilmette voters, who the trustees represent, should be of primary importance in trustee decision making. The mandate itself, as expressed in the memo of December 27th, places inordinate emphasis on determining the impact of ordinances on businesses in Wilmette and omits the effects upon residents and workers. It states “...the impact on businesses, employees, and the Village as an overall economic engine.” We all know the community is much more than just an economic engine. It is also a place that expresses the values, perspectives, goals and hopes of residents. 1. While this work needs to be done as expeditiously as possible, the number, timing, and frequency of meetings should be determined by the work that needs to be accomplished. Schedule should be determined by measures of output and should not already be finalized. 2. While there have been several mentions of setting aside bias, based on the information shared when committee members introduced themselves at the beginning of the meeting, it was clear that some members of the working group consider themselves as representing small business. If members are to represent constituencies, it was not clear who was representing minimum wage workers. 3. There seemed to be a hesitation to consider peer-reviewed quantitative analyses due to concern about potential biases, conflicting results, and applicability to the unique attributes of Wilmette. While of course there may be studies that demonstrate bias, there is a large body of analyses that are credible and relevant. There are also metaanalyses and literature reviews that examine bodies of studies and address issues relevant in apparent conflicting results. In order to obtain the necessary information, we recommend the working group seek and consider these types of analyses. 4. It appears that there continues to be a reliance on anecdotes and speculation as evidence. We urge the committee to rely on data for decision making. These comments and recommendations are intended to to strengthen the process and perception of the working group and we hope the comments will be received in that spirit. In a separate communication, we will submit the LWV-W suggestions of specific questions for investigation by the committee.